The President of Rwanda, Paul Kagame, recalled a sentence stuck in his memory since childhood: “Everything is agriculture, the rest is good luck”. 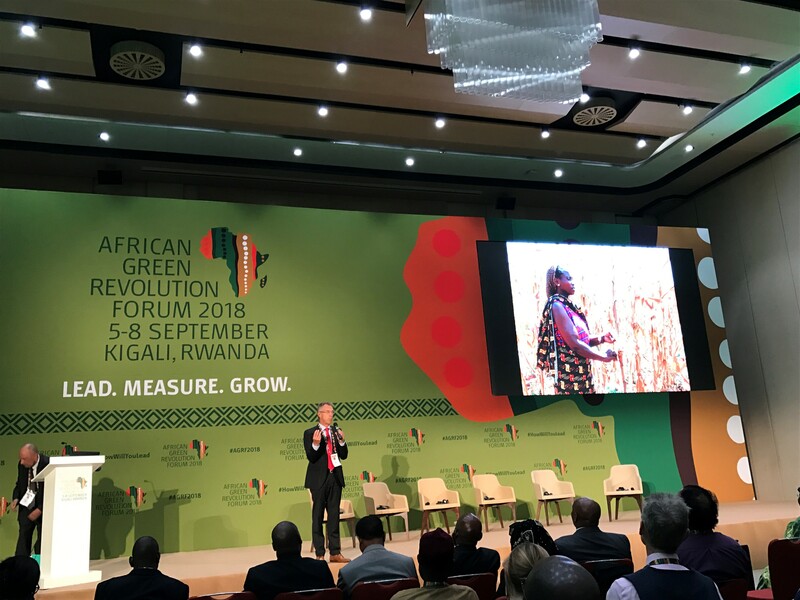 All the top leaders present at AGRF 2018 agreed that investing in smallholder agriculture is a top development priority, since the growth of the primary sector “drives down poverty, two to four times faster than other sectors” and provides livelihoods for three quarters of the African population. Even though African governments agreed on a roadmap towards inclusive agricultural growth — the Comprehensive African Agriculture Development Programme, or CAADP — in 2003, the agriculture sector has remained stagnant since the 1980s. A majority of African countries continue to be net food importers despite their bountiful natural resources, as highlighted in the Africa Agriculture Status Report 2018. Some African food ventures are quite successful exporting beans, roses or avocados to Europe. However, most African farmers still live on less than one dollar a day, on small rain-fed plots of less than two hectares, having to cope with high climate variability and damages from numerous pests and diseases. They often plant low quality seeds, on acid and degraded soils, with little fertilizer. Rapid ageing of the farming population, 60 years old on average, is a particular concern at a time when many young people are underemployed. “African agriculture is at a defining moment” was a message hammered home by several keynote speakers of AGRF 2018. So what makes this moment different? In recent years, some countries have seen a significant rise in farm productivity. Ethiopia, for instance, exceeded the CAADP target of 6 percent annual agricultural growth in the last 25 years, halving its poverty rates over the same period. African agriculture is facing new threats, from climate change to devastating pests like the fall armyworm, but researchers can be fast to respond, particularly if they are properly funded and listened to. “The challenge is to design the right partnerships or business models between research, government, civil society and the private sector, to reach impact at scale”, explained CIMMYT’s director general, Martin Kropff. One example would be the Fall Armyworm Research for Development (R4D) International Consortium, officially launched at AGRF 2018. CIMMYT has also partnered with public and private organizations to implement a very successful breeding program to fight maize lethal necrosis and to develop detailed guidelines for integrated pest management of the fall armyworm. Research has to anticipate and respond to the needs of smallholder farmers in diverse ecological and socioeconomic contexts. The agenda has to become demand-driven and researchers have to look at new collaborations if they want to reach the farmers. Leaders discussed the ways to build viable, fair and sustainable food systems that will provide good opportunities for African farmers, especially the next generation, and affordable, nutritious food for the whole population. In their view, the roadmap for the coming years includes several key actions: investing in infrastructure, investing in youth and education, investing in value addition and food processing and removing trade barriers. Speakers also flagged irrigation as a top priority. “African farmers do not need rain; they need water,” summed up John Mellor, who coordinated the African State of Agriculture Report 2018. He explained that top-down irrigation schemes are difficult to manage and maintain, so the focus should rather be on farmer-led irrigation. The conference highlighted how digital agriculture, big data and other innovations offer the opportunity to leapfrog agriculture growth and make farming attractive to youth. For instance, Hello Tractor, supported by CIMMYT, is an Uber-like service linking tractor owners and machinery service providers with farmers. CIMMYT research shows that appropriate rural mechanization adapted to smallholders, like two-wheel tractors, will ease labor problems and enable adoption of more sustainable practices, like direct sowing. This can make farming more attractive for young people and create opportunities for them to become service providers. Many innovations are out there to help African farmers grow more and better food; from climate resilient new varieties and customized agronomic advice to new e- or m-business models. Mobile finance solution Tulaa brings together farmers, agro-dealers and credit providers on a virtual marketplace. Through Tulaa, farmers can borrow money to purchase the right fertilizers or seeds at the right time. Another platform, Precision Agriculture for Development, is providing more than 120,000 Kenyan farmers with agronomic advice via SMS, so they can better identify and manage fall armyworm. Other new digital platforms are linking smallholder farmers with quality inputs, extension services, finance, food processing and market opportunities. All these operators will need to use accurate, science-based data. That is where CIMMYT’s expertise could play a big role, for instance providing customized fertilization recommendations to individual farmers, as planned in the Taking Maize Agronomy to Scale in Africa (TAMASA) project. B.M. Prasanna, director of CIMMYT’s Global Maize Program, concluded that “AGRF is an excellent platform to network, debate issues relevant to African agriculture, form alliances and think forward.” Providing more resources in agricultural research for development will generate a stream of new technologies and solutions that will drive agricultural growth. Something African countries urgently need with their fast-growing population (2-3 percent annually) and one additional billion people to feed by 2050.